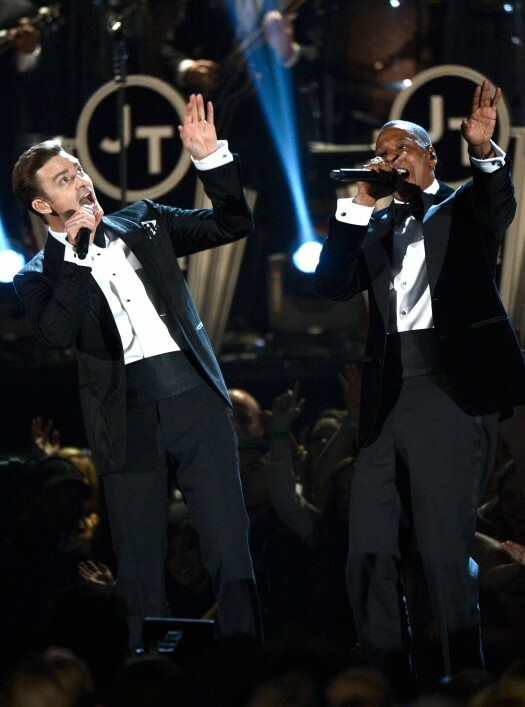 Justin Timberlake stole the show at the 55th annual Grammy Award’s in more ways than one. 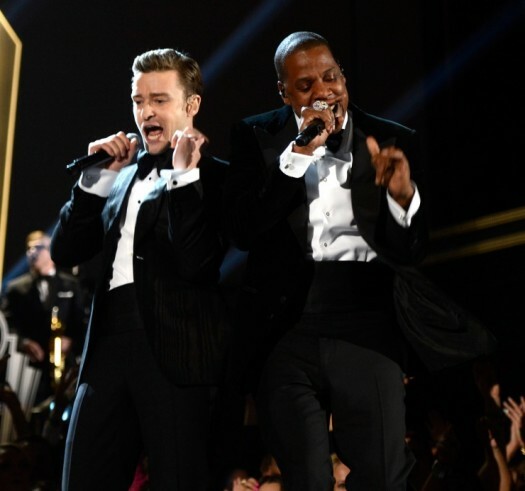 The singer returned to the Grammy stage after a four year absence and, joined by fellow artist Jay-Z, brought the house down with a show-stopping rendition of his new single “Suit & Tie”. The performance had a definite retro vibe that was emphasized by the sepia-toned broadcast and the back-up band and dancers that hearkened back to the Big Band days of old. 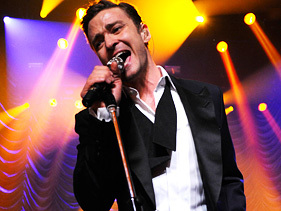 “Suit & Tie” was followed with the premiere of “Pusher Love Girl,” the second song from his upcoming album The 20/20 Experience. It was so good people have created gifs of the performance. However, the fun didn’t stop there. 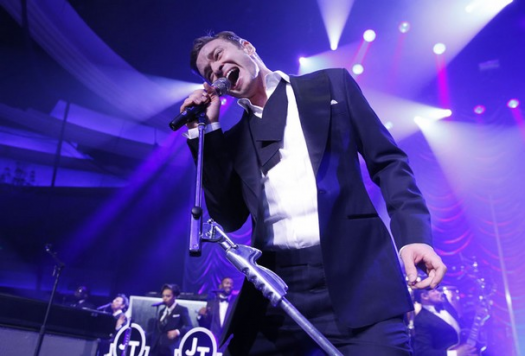 JT followed up his Grammy performance with a concert at the Hollywood Palladium late Sunday night. The evening offered guests their first real taste of the full 20/20 Experience as a more casual JT entertained the sold-out crowd. The best part of all of this (to me anyway)? He looked incredibly suave decked out in head-to-toe TOM FORD. You can not beat that. 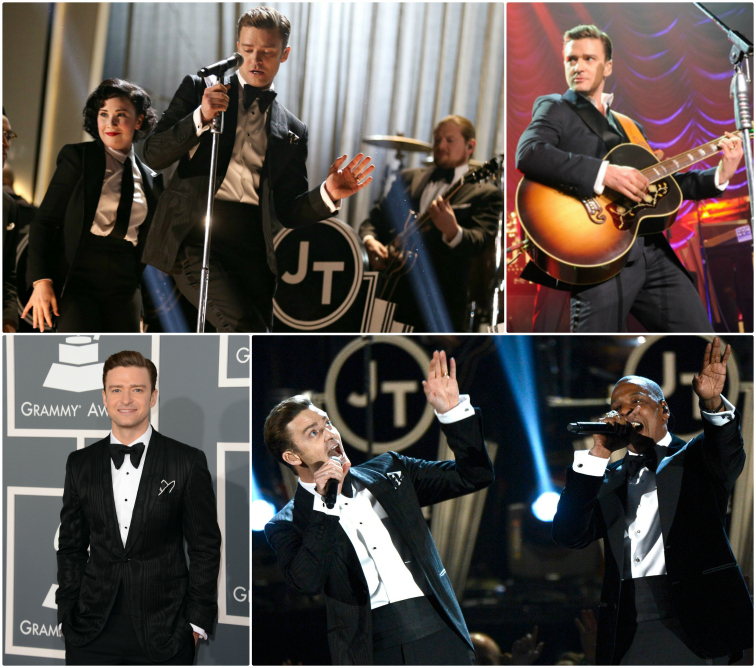 Justin spent in the evening looking dapper in a black moire TOM FORD cocktail jacket, evening shirt, evening pants, silk bowtie, silk pocket square, onyx studs and cufflinks and black and white loafers. 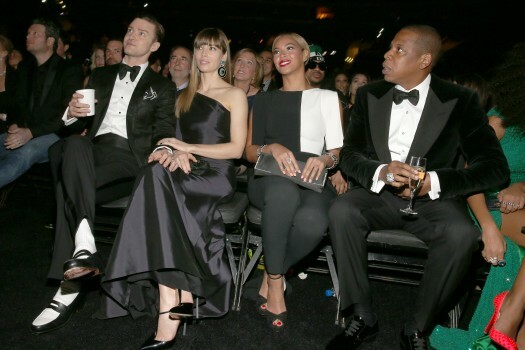 Jay-Z joined him in the TOM FORD love by wearing a black velvet TOM FORD cocktail jacket with a grosgrain lapel, evening pants, evening shirt, silk bowtie and evening shoes. 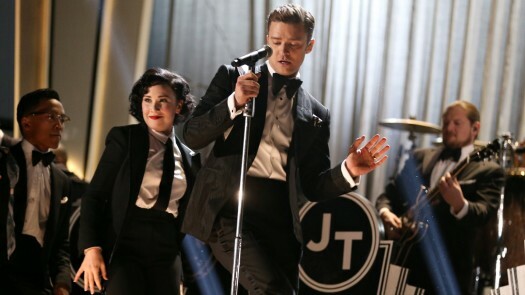 If that wasn’t enough, even the backup singers, dancers and band wore TOM FORD tuxedos. He mixed it up a bit for the gig at the Hollywood Paladium and changed into a navy TOM FORD tuxedo with a satin peak lapel, evening shirt, open bowtie, white silk pocket square and black and white spectator loafers. Clearly, there can be no The 20/20 Experience without TOM FORD. 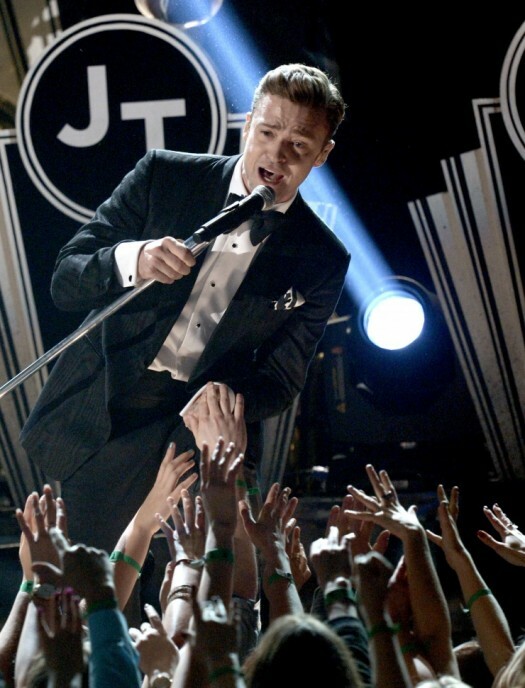 What did you think of JT’s performance? How about that tuxedo? Gorgeous, no? 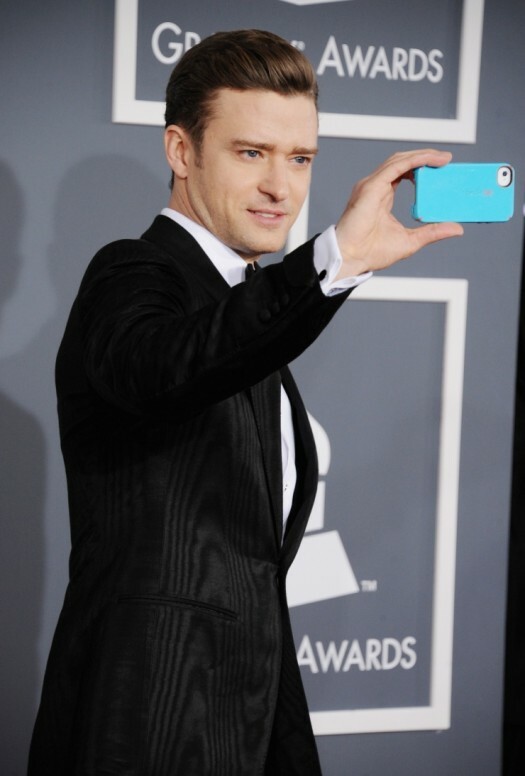 attends the 55th Annual GRAMMY Awards at STAPLES Center on February 10, 2013 in Los Angeles, California. 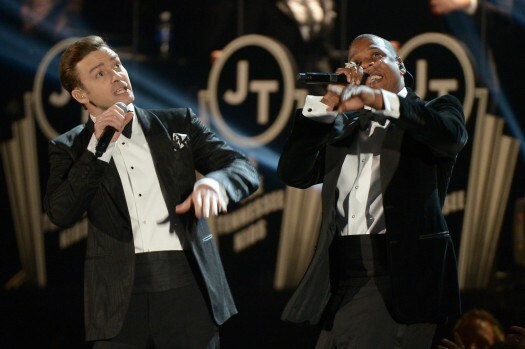 Justin Timberlake and Jay-Z perform at the Grammys. 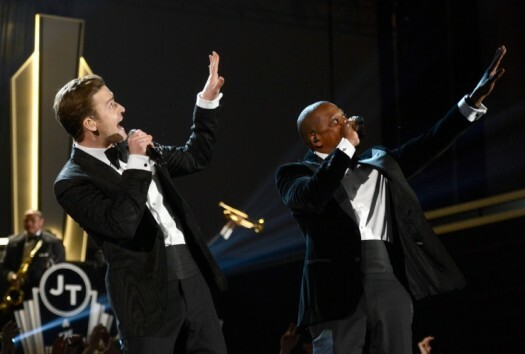 onstage at the 55th Annual GRAMMY Awards at Staples Center on February 10, 2013 in Los Angeles, California.